In the book of Genesis, we read the story of Jacob and Esau. Jacob wrestles with God, but then God gives Jacob the new name Israel which loosely translated means “he who wrestles with God.” In Jacob’s wrestling, we are reminded that we have a God that we can wrestle with when we are doubting and when we have questions. After Jacob wrestles with God, we expect him to be reunited with his brother as they fight. But the unexpected happens, Jacob and Esau don’t fight. Actually Esau spots Jacob and runs directly for his brother. They embrace each other. In that interaction, we see the power and beauty of God’s grace. It really takes a lot of courage to ask for forgiveness. Doesn’t it? The first summer that I worked at Bible camp, many of the staff had worked at that camp for several summers already. They knew each other very well and stuck in their group of friends. There were times that many of us new staff felt very much excluded. But the gift of grace is that several years later, a few of those returning staff came to my friends and I. I remember one conversation in particular when one of the gentlemen looked at us and said, “I’m sorry. We never treated you very fairly.” In hearing those words, I immediately saw the work of God’s hand at play. God’s grace was being extended between all of us. Forgiveness offered by and to each other is God’s grace again placed on the table for us to receive and extend to each other. It is this gift of grace that reminds us that we are to offer forgiveness to one another. This entry was posted in Uncategorized and tagged #write31 days, 31 Stories of God's grace, Esau, forgiveness, Jacob by tara.ulrich. Bookmark the permalink. 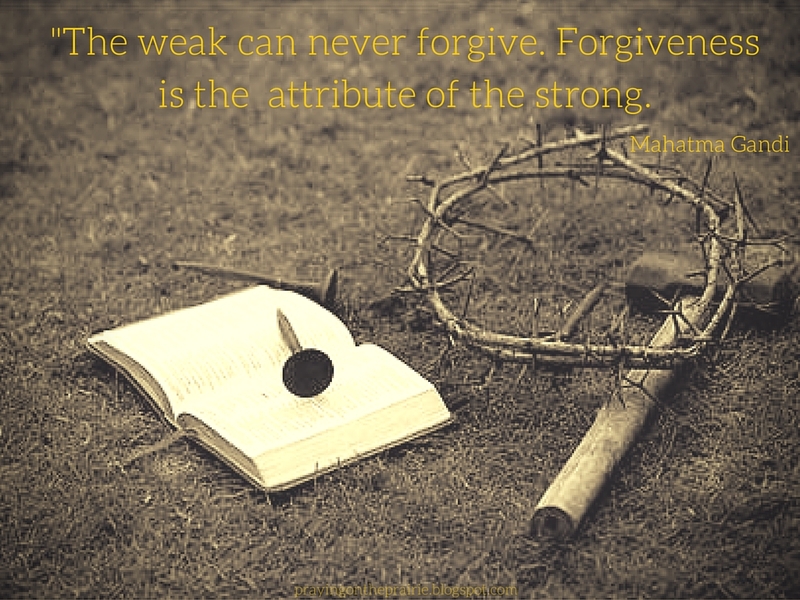 Forgiveness is such a powerful example of God's grace. Just as we can only be forgiven by God's grace, we need his grace to enable us to forgive others too and there is something beautiful about a relationship which was damaged but has been restored. Great post! Carly, it truly is, isn't it? Yes we do need God's grace to enable us to forgive others indeed. Thank you! I like the quote by Ghandi and I especially like the analogy of God's gift of grace is placed on the table for us to receive. There is so much to say about this important topic, good, job and keep writing! That Ghandi quote is great, isn't it? Thank You! I always love your stories, Tara. I'm thankful Jacob wrestled with God because it gives us hope that He tolerates out questions. And I'm glad you've been able to forgive. That's hard, but I'm so glad that Christ forgave me! Ruthie, thank you! I too am glad that Jacob wrestled with God. I too am glad that Christ forgave me. I am loving your series on grace. There is so much grace in forgiveness and I have learned that well in my own life. Hugs to you friend! Thank You, Mary! Hugs back to you!! Hey girl! This is beautiful. Grace and forgiveness go hand in hand, and are so important to walking in victory! Great post! Oh, so very true! I need to extend grace and forgiveness–even when others don't ask for it. I also need to be brave enough to ask for forgiveness when I have wronged someone else. I am so glad that you were blessed with awesome youth pastors and that they are still a part of your life today.